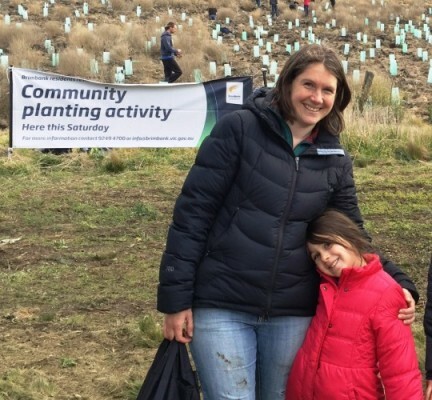 Over 140 local Brimbank volunteers and council workers braved chilly conditions on Sunday 26 July to plant over 1300 plants for 2015 National Tree Day. 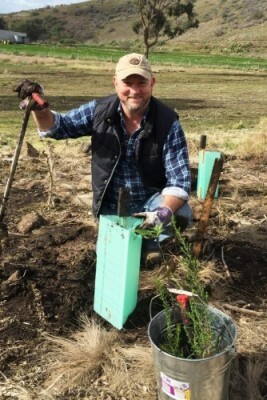 The plantings took place at Sydenham Park in Keilor (behind Keilor Public Golf Course) and along the Kororoit Creek in Sunshine. Volunteers with different abilities performed different roles, some making up tree guards on the flats, some planting on slope of valley, some welcoming other volunteers. The day was a huge success with volunteers planting 1100 trees and shrubs, adding to the 1700 planted last year. It was a challenging 12 degrees and windy but keen planters started arriving at 10am with the Victorian Mobile Landcare Group transporting them by 4WD into the Maribyrnong Valley. At the planting area Brimbank staff and Friends of Organ Pipes National Park told everyone about the history of site, and how and where to plant. After planting, it was back up to the marquees to enjoy a warming BBQ cooked by the Rotary Club of Brimbank Central, and learn about local native animals with the ‘Bush Babies’. 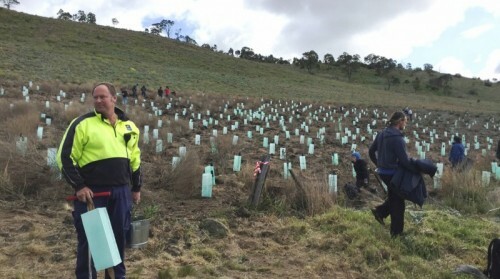 The Friends of Kororoit Creek teamed up Phu Dong Scouts and local residents to plant 200 trees and shrubs along the Kororoit Creek. This is the second year the ‘Friends’ and Scouts have worked together to beautify their local waterway. Following an earlier request from the Scout Leader, one of our Conservation Team members from Council's Environment Department sat down with the Rovers and provided detailed information to assist them in gaining their Landcare Badge. Community Particpation Makes it Happen! Thanks also to the Roads, Hall Keeping, and Parks departments, and Keilor Golf Course, for their assistance. National Tree Day planting is an important part of the Maribyrnong River's landscape scale rehabilitation. 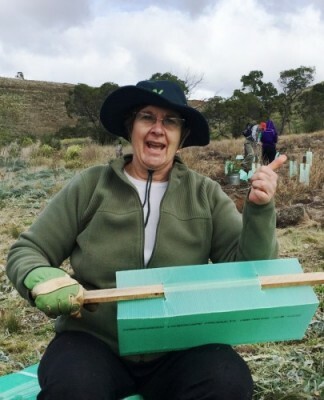 It ensures that rabbit and weed control is more effective and revegetation works towards a continuous green habitat corridor along the Maribyrnong River for kangaroos, Swamp Wallabies, Brown Falcons, echidnas, wombats, possums.